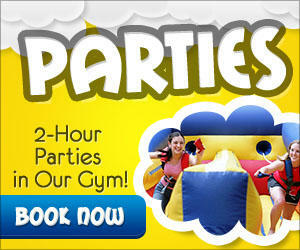 Click to see our different party options including pricing on each of our parties! Bring your OWN food and decorations! * If you book a party with us, you are welcome to bring in your own food and decorations! However, we do offer great prices on large one-topping pizzas, ice cream cups, soft drinks, bottled water, juice pouches, themed decorations (of your choice) and colorful balloons to make it easy on you! * A party MUST be booked in order to bring in food, decorations and gifts. Bounce Passes or the purchase of Open Play admission cannot be used to set up for a party. Two Hour Party Times! You will get 2 full hours to celebrate and bounce in our 9,900 sq ft indoor inflatable fun center complete with 8 HUGE inflatables!! A party host that does it all! From set up to clean up, we work hard to make it easy on you! A FREE Open Play voucher for the birthday child to come back again! Each party guest (child) will receive a Buy One-Get One FREE Open Play voucher to use at a future Open Play! Depending on the party option that you choose, you will receive either reserved tables in our party area (for groups of 6 - 10 kids) or your own private party room (for groups of 15-25 kids)! A deposit of just $50 holds your date! Deposits are non-refundable to guarantee your date is held. This deposit is applied towards the total cost of your party. The remaining balance for your party will not be due until the day of the party but will need to be paid before your party begins. We cannot accept checks, so remaining balance payments can be made by credit card, debit card or cash only please. Before booking, please refer to our Frequently Asked Questions page for additional party information and rules. Give us a call at (865) 407-0111 if you would like to schedule a tour of our facility! Ready to book?! It's EASY! Just click below to get started!